Contrary to popular belief, you don't have to purchase an ugly toilet in order to create a green bathroom. With all the great high efficiency toilet designs on the current market, you're sure to find a toilet that fits your décor without harming the environment. Take a look at these top high efficiency toilets for a bit of design inspiration. 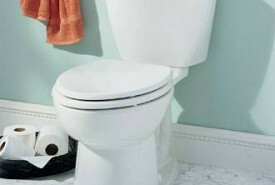 Sterling (a Kohler brand) toilets are affordable and eco-friendly. 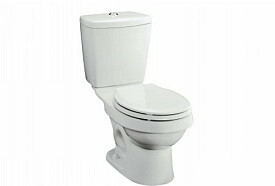 Dual flush toilets allow you to choose the amount of water that you use. While these toilets are standard throughout Europe, they are just beginning to burst onto the North American scene. 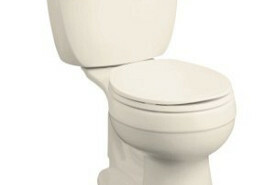 Check out Sterling's line of dual flush toilets by visiting the Sterling Web site (prices are available upon request). Photo credit/available at: Efaucets.com. American Standard has been making quality toilets for decades. 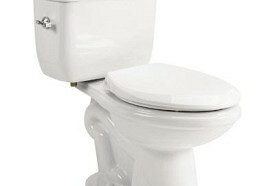 Recently, American Standard has come out with an entire line of eco-friendly toilets. The Cadet model combines form and function to create a toilet that's as effective as it is aesthetically appealing. Photo credit available at: Absolutehome.com. The great thing about this Kohler innovation is the fact that the Cimarron comes in a variety of cool colors. Select from ice grey, black black, almond, biscuit, or white - no matter what your bathroom color scheme looks like, Kohler's eco-friendly toilets are sure to make a statement. Photo credit available at: Us.kohler.com. 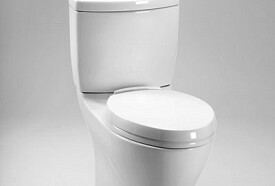 Pegasus is a relatively new toilet manufacturer. However, this company is quickly gaining a reputation for creating reliable, durable, eco-friendly toilets. The cottage collection is both sophisticated and stylish, making any toilet in this collection the perfect addition to your bathroom. Photo credit available at: Homedepot.com. Sometimes it's hard to find eco-friendly products to match a vintage décor. Now that companies such as Caroma have entered the green toilet scene, continuing your vintage theme inside of your bathroom is easier than ever. 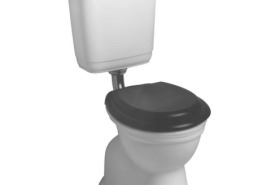 This lovely "toilet suite” comes in either black or brown, and it is entirely eco-friendly. Photo credit/available at: Caroma.com.au.